A Last Will and Testament (aka Will) is a legal document which determines what will happen to some or all of your property after death. Please be aware that the disposition of some types of property may not be governed by your NJ Last Will and Testament. For example, property that you hold jointly with someone else (for example a joint bank account) will pass automatically to the surviving joint owner when you die. Your estate plan should take these ownership concerns into account, so that it represents your chosen wishes. Most people should have a Last Will and Testament. Die without one, and the State of New Jersey decides who gets what, without regard to your wishes or your heirs' needs. What are the requirements of a Last Will and Testament? 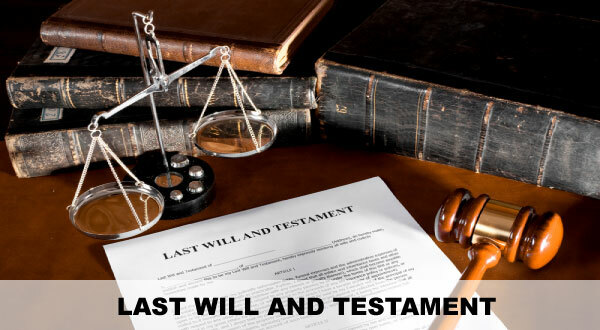 A NJ Last Will and Testament should contain the name of an executor, information relating to one's burial, payment of any debts, any charitable donations, bequests to beneficiaries and the list of the powers of the executor. The testator (the person signing the Will) must demonstrate that the document was not created under duress or provocation (that he created the last will freely and willingly). The signing of the Last Will and Testament must also be witnessed by two people. What if I die without a Last Will and Testament? If you die without having a valid NJ Last Will and Testament your estate will be administered in accordance with New Jersey state law. The state will determine who has the right to act as administrator of your estate, the guardians of your children, and who will be the beneficiaries of your estate. Also, if a family member volunteers to act as administrator of your estate, they will be required to post a bond with the court. The premium you have to pay to an insurance company to obtain a bond can be very costly depending upon the size of the estate (If you prepare a last will no bond is required). Additionally, any opportunity to minimize estate taxes will be lost. How will daily and educational expenses be met? At what ages should my children receive property? When should my NJ Last Will and Testament be changed or updated? The birth of a child or the divorce of a person who makes or is named in a will may automatically change the legal effect of a last will without your knowledge. You should always review your NJ Last Will and Testament with a will attorney on a periodic basis to avoid these unintended consequences. Plan your future and the future of your loved ones. Contact an experienced will attorney at Pinard Law, LLC without delay to ensure that your estate is distributed to your chosen heirs while paying a minimum of taxes and administration expenses. A will attorney at Pinard Law, LLC can help you prepare your NJ Last Will and Testament in a cost effective manner.